Metal detection in the automotive industry requires more compact sensor technology to manage constant change in metals and application variations as parts move through the line. Turck’s new low-profile weld nut sensor is a compact solution for applications that require a reliable detection for the presence or absence of a nut welded to sheet metal on various vehicle components. Like the other sensors in this family, Turck’s new low-profile design uses magnetic inductive technology and can be simply programmed to detect the presence of a metallic nut. An optional teach pendant can be used to program the sensor to differentiate between the sheet metal material and the weld nut. When the nut is properly placed, the sensor sends a signal to the PLC, which allows the robotic welder to weld the nut to the sheet metal. Turck’s new low-profile weld nut sensor measures 61 mm, with a probe tip diameter of 4 mm to accommodate down to a 5 mm weld nut. The sensor has a titanium nitride coated probe for greater strength and protection in harsh applications. The cable version includes a robust TPE-style jacket with a molded M12 connector for flexible mounting possibilities, and a four-way LED for visibility from multiple sides. Turck expands its RFID offering with an economical UHF handheld device. The PD-IDENT handheld provides customers with a lightweight, easy to use smartphone RFID reader system. The handheld device houses a UHF antenna and connects to the user’s smartphone via the audio port. Additionally, Turck is providing customers with a basic, multipurpose Turck RFID app for their iOS and Android mobile devices (Windows support will be added in the future). As with all of Turck’s handheld RFID solutions, it can be used in conjunction with Turck’s BL ident® RFID system. Measuring at 159 x 95 x 39 millimeters, the PD-IDENT easily fits in the palm of your hand and allows for the accommodation of a multitude of smartphone designs. The solution also comes equipped with a lithium-Ion battery, which will last up to two hours of active scanning on a charge. The free app can be downloaded from the Apple or Google Play Stores today by simply searching for “Turck RFID”. The PD-IDENT has an operating frequency of 865-928 MHz and follows EPCglobal Gen 2 and ISO 18000-6C. The user simply selects a region upon initiation of the device to conform to local radio communication requirements. Turck’s flexible RFID solution, BL ident, was created to offer a solution for industrial RFID applications while retaining the flexibility of standard I/O solutions. BL ident allows you to order RFID in the same package as you are used to, as slices for modular I/O or channels for block I/O. The Turck BL ident solution allows for easy integration into existing control systems and supports all of the major networking protocols providing an all-in-one industrial RFID solution for whatever your application demands. Turck is announcing a new HMI series: the TX500 HMI PLCs. 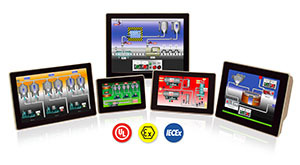 With high-end touch displays and fast processors, these HMIs are ideal for use in small- to medium-size machines whose processes have to be controlled, displayed and operated locally. Each TX500 is equipped with a PROFINET master and EtherNet/IP scanner, as well as a Modbus TCP and Modbus RTU master. The HMIs can also be run as field devices for both Modbus protocols. Codesys3 allows the lean and simple programming of the PLC and visualization functions. The latest processor technology in the units guarantees the smooth handling of computing intensive processes such as moving image visualizations. The high resolution TFT display with 64,000 colors enables attractive and high performance of graphics and animations, and the front panel is protected to IP66. Two RJ45 Ethernet ports, a serial interface for RS232 or RS485 as well as two USB ports are provided on the terminal side. An additional SD card slot makes it possible to expand the 128 MB internal data memory. Turck is offering the TX500 series in three variants with different display sizes and resolutions: two 16:9 displays with 7” or 13” (TX507 and TX513) diagonals and one 10” device in 4:3 format (TX510). The two smaller displays offer 800 x 400 pixels, while the large TX513 comes with 1280 x 800 pixels. Minneapolis, MN—October 4, 2016—Banner Engineering has added flush mount housings to its rugged, industry-leading series of Q4X laser distance measurement sensors. The new flush mount configuration offers a more compact housing to expand applications and increase mounting flexibility in constrained spaces. The Banner Q4X offers superior performance, ambient light resistance and durability, with reliable detection of sub-millimeter changes in distances ranging from 35 to 310 mm. Utilizing a CMOS imager for reliable measurements, the Q4X offers dependable performance with highly reflective and multi-color surfaces, or light-absorbing materials and low contrasts, such as black foams or rubber combined with black plastics or metals. With dual teach mode, the Q4X uses a combination of intensity and distance, making it ideal for error-proofing applications and reliable detection of challenging targets, such as clear packaging and transparent object detection without a retroreflector. Banner Q4X laser distance sensors are available with discrete, analog (0 to 10 V or 4 to 20 mA), and IO-Link output options. The robust Q4X housing is rated to IP69K with FDA-grade stainless steel, and its rugged design resists mechanical impact, over tightening and extreme vibration. A highly visible, four-digit, angled display with sub-millimeter resolution is easily viewed from multiple vantage points. Yes! The eWON Flexy now features an OPC UA server and is the first of its kind to do so! But what is OPC UA? The OPC UA server is your great companion when you need to share key values of your equipment on the factory floor. Quick configuration, completely independent from the PLC. This makes not only your existing, but also your legacy PLC's compliant to the OPC UA standard. Integration of machines within factory is now at your fingertips and ready for the IIoT future! To help engineers improve sensor operations in unique applications, Turck introduces six line extensions to its ultrasonic sensor offerings. These new products expand the breadth of Turck’s solutions to build a more comprehensive ultrasonic sensor portfolio for its customers. Ultrasonic sensors are ideal in applications with demanding requirements, such as long sensing ranges, non-metallic, irregularly shaped or transparent targets, wide sensing areas and when dust or oil films are present. Featuring advanced technology, Turck’s ultrasonic sensors address these challenges to deliver dependable object detection. The sensors are available in a variety of housing styles with multiple feature sets to solve difficult applications. The rectangular packages of the CP40 and CK40 product families offer sensing ranges up to two meters with either a single digital output or a digital and analog output. The barrel style family offers 18 and 30 mm barrels with either a single digital output, dual digital outputs, or a digital output and an analog output. The digital and analog output version offers the advantage of IO-Link capabilities, making parameterization, diagnostics, and replacement easy. N-Tron® series of industrial Power over Ethernet Plus (PoE+) Gigabit products: NT24k-16TX-POE, 1008TX-POE+ and 1000-POE4+. These new POE+ switches and injectors complement Red Lion’s industrial networking portfolio to offer customers additional PoE options that drive operational efficiencies while addressing industry demands. NT24k-16TX-POE: Layer 2 managed Gigabit switch provides 16 10/100/1000BaseT(X) RJ45 ports. Advanced PoE management allows quick and easy allocation of the switch’s 240 Watt PoE power budget to any of its 16 ports (up to 30 Watts per port). Additional comprehensive features include auto IGMP configuration, N-Link™ and N-Ring™ technology, RSTP, N-View™ monitoring, CIP messaging, SNTP, IEEE802.1x and Radius remote server authentication. 1008TX-POE+: industrial unmanaged Gigabit switch provides 8 10/100/1000BaseT(X) RJ45 ports, including 4 PoE+ capable ports (up to 30 Watts each), jumbo frame support and LED link/activity and PoE status indication. 1000-POE4+: 8-port Gigabit mid-span PoE+ injector provides 4 10/100/1000BaseT(X) RJ45 ports (data in) and 4 10/100/1000BaseT(X) RJ45 PoE+ ports (data and power out) that support 30 Watts per port. All three PoE models include a built-in power boost circuit that allows 24VDC power input to meet PoE voltage requirements. For more information, visit www.redlion.net/products/industrial-networking. York, Pa. – October 18, 2016 – Red Lion Controls, the global experts in communication, monitoring and control for industrial automation and networking, today announced its rugged Graphite® platform has been expanded to include a new Graphite Core Controller and Graphite Crimson® Control Module that combine communication and control capabilities to reduce cost and ease operations. Both hardware offerings leverage an enhanced version of Red Lion’s powerful Crimson 3.0 software with added Crimson Control functionality to provide a single programming solution for control, networking and data visualization. Graphite Core Controller: rugged standalone industrial controller that features all-metal construction and works with a variety of I/O modules to combine IEC 61131 control capabilities with networking and data visualization alongside the core functionality – protocol conversion, data logging and web serving – of a Graphite seven inch HMI minus the graphical display. Graphite Crimson Control Module: control module that plugs into Graphite HMIs to form an all-in-one industrial solution that adds IEC 61131 control functionality without requiring additional panel space or a separate programming package. To support this extended functionality, Red Lion now offers rugged Graphite expansion racks that work with the Graphite platform to provide a scalable solution enabling organizations to remotely mount up to twelve plug-in modules to the back of a cabinet without extensive wiring. Each rack supports up to three plug-in modules and can be installed for a maximum of twenty modules per tethered Graphite connection. Red Lion’s Graphite platform includes a built-in web server that enables users to monitor and control applications via PCs, tablets or smartphones. SMS text-messaging and email alerts provide early warning of process issues, which helps avoid costly downtime or site visits. In addition, protocol conversion lets customers select from more than 300 industrial protocols to seamlessly integrate disparate devices such as PLCs, drives, cameras, barcode readers and panel meters. The Graphite platform is ideal for factory automation and process control environments that may include manufacturing, oil & gas, water/wastewater, power, utility transportation and maritime. Applications include tank batteries, pipelines, salt water disposal, pump stations, lift stations, substation controls, solar array positioning and railroad trackside controls. For more information, visit www.redlion.net/Graphite. Turck announces the availability of EtherNet/IP enabled encoders, providing an optical based encoder solution with electronic multi-turn capabilities for position applications requiring feedback for customers using the EtherNet/IP and CIP (common industrial protocol) interface. Common applications for the ODVA-certified encoder include automotive production, logistics, metal processing, textile applications, as well as printing and packaging machines. The new EtherNet/IP encoders are available in both singleturn (RS-107/108) and multiturn (RM-105/106) variants and come with a diameter of 58 mm, offer a total resolution of up to 32 bits (16 for singleturn, 16 for multiturn), and have been designed specifically for high-speed applications. The encoders offer an RPI (requested packet interval) time of 1 ms, and allows operation in high-speed applications with up to a 1,000 Hz update frequency. These features allow users to save time and costs. The RS-107/108 and RM-105/106 EtherNet/IP encoders offer a cost effective, compact EtherNet/IP encoder solution with Device Level Ring (DLR) capability. The DLR capabilities allow the network to stay active even if one direction of the communication bus line is compromised. This is a bi-directional communication capability built into the encoder. For the customer, it means that their process can continue while one unit is off-line, greatly influencing efficiency and reducing costly down-time. The RS-107/108 and RM-105/106 encoders are available in solid shaft and blind hollow shaft versions, with the blind shaft version having diameters up to 15 mm. The encoders feature an operating temperature range from -40 to +80 °C and are IP65 rated. Additionally, thanks to their optical design, the encoders are highly immune to interference from magnetic fields. 8/28/2016 - Advantech’s latest UNO is the smallest yet, but still packs a punch in terms of flexibility. The pocket-size UNO-2271G is the same width and length as a 2.5” SSD but still includes the ability to expand its performance to meet your needs through six mounting solutions (Stand, Pole-mount, VESA, DIN-RAIL, Wall-mount, and vertical mount) and over 30 iDoor modules. This combination gives users over 100 possible combinations to meet all possible needs. The entry level system includes enough features to perform basic functions, however for increased functionality an additional module which accepts iDoor Modules is recommended. Advantech’s iDoor technology is a modular way of adding flexible functionality to a wide range of devices and gives system integrators the flexibility to choose the functions that they need without purchasing devices that have excess costs and functions that they’ll never use. There are over 30 iDoor Modules for tasks as broad as: Fieldbus protocols like Profibus, Profinet, EtherCAT and Powerlink; memory expansion and storage with Backup MRAM, Cfast/Compact Flash and SD/mSD; digital and analog I/O such as multi-function, analog IO, digital IO & counter; smart sensors such as Smart Meter, Pressure Sensor, temperature sensor and light sensor; and communication such as GPS, 3G, LTE, Wi-FI, GPS, GPRS, ZigBee, RFID, Bluetooth and LTE. As you’d expect from a modern IPC, the UNO-2271G has been designed for cloud enabled HMI solutions and has integrated remote display technology which enables users to remotely control the UNO-2271G from mobile devices or other PCs via VNC (Virtual Network Computer). For a more visual system, the UNO-2271G also supports WebAccess/HMI. WebAccess/HMI is visualized HMI Runtime software which covers the whole range of HMI control and visualization in machine industries through its high degree of customization and user-friendly interface. Combined with the remote display technology of UNO series models, operators can diagnose and control machines through VNC clients without being present onsite. WebAccess/HMI software enables data transfer between units and the management system by providing over 450 PLC and controller communication drivers. With the industrial IoT gateway, it eliminates the barrier of different language of devices and easy to integrate into existing system. 8/23/2016 - Advantech is pleased to announce the launch of UNO-3283G and UNO-3382/ 3384G fanless industrial computers. Advantech’s 3000 series of industrial computers are renowned for their high performance, large number of I/O ports and flexible expansion. UNO-3283G & UNO-3382G/ 3384G include dual front-hot swappable SSD/HDD bays with RAID 0/1 support. HDD/SSD are installed in drive bays which are accessible from the front using a single captive thumb screw for each bay, so that in the event of failure or an upgrade this can be carried out quickly and easily. These new models boast many new features, which make them ideal for factory and machine automation. To provide optimum flexibility of the already ample I/O ports, the new models support iDoor technology which provides users with a host of additional modular I/O port options such as industrial fieldbus, wireless connectivity and PoE for smart cameras in production inspection applications. Combined with a motion and frame grabber expansion card through PCIe/PCI, UNO-3283G & UNO-3382G/ 3384G series are the ideal solution for machine motion and vision control applications. To aid maintenance flexibility, UNO-3283G has been designed with anew ‘L’ shaped removable cover which enables access to the inside of the machine in a much more convenient manner than before. The ‘L’ shaped cover has been designed with “captive screws” to prevent loose screws falling out during operation or removal of the cover. The clever design also allows users to gain easy access to the PCI/PCIe sockets, iDoor module, CFast slot and RTC battery for installation and maintenance. UNO-3283G comes with an Intel® 6th Generation Core™ i7 processor which gives an up to 79% increase in speed over 3rd generation CPUs. The ruggedized design supports power redundancy and operating temperatures from -10~60 ?, ensuring they can withstand harsh industrial environments. The robust design ofUNO-3300 series is also proven by its UL/IEC-61010 certification, which is the standard for industrial applications. In addition to all these compelling features, UNO-3283G also provides dual video ports for DVI-I and HDMI displays and supports multiple mounting methods like Stand, Wall and Enclosure mounts, thereby further increasing their flexibility to work in almost any location. August, 2016, Taipei– Advantech, a global leader in IIoT solutions announces the latest release in its renowned Panel PC line. The PPC-3060S is a 6.5" industrial-grade Panel PC for compact applications for machine builders. The PPC-3060S is a highly reliable and capable Panel PC in a fanless design with a low power Intel® Celeron N2807 1.58GHz Processor at its core. With a high durability design, the PPC-3060S is equipped with a true-flat touch screen with IP65 front panel protection, die-cast AI Alloy enclosure and 5-wire resistive touch screen. It supports two serial ports, three USB ports, and two GbE LANs to satisfy various industrial applications. PPC-3060S supports the most popular operating systems, such as Microsoft Windows 7, WES7, Windows 8.1, Windows 10, Linux and Android. Advantech’s The PPC-3060S low power fanless touch Panel PCs comes with a dynamic modern appearance suitable for the Industry 4.0 era. The 6.5” PPC-3060S has a True Flat display with no bezel which makes it easier to read and incorporates a durableindustrial ELO 5-wire resistive touch screen that works well in industrial environments and is better resistant to scratches. It uses a die-cast aluminum alloy enclosure with IP65 certified front panel protection ensuring it can be used in tough environments without fear of knocks or water and dust ingress. PPC-3060S uses an Intel® Celeron Dual Core N2807 1.58GHz processor which supports turbo boost from 1.58GHz to 2.16GHZ, and low power TDP is 4.3W. The Intel Celeron dual-core processor, PPC-3060S deliver a 230% superior computing performance compared to previous the model – PPC-L62T. It also features up to 4GB DDR3L SDRAM memory, dual GbE LAN for redundancy, two serial ports, and three USB ports to make it easier to satisfy various simple industrial applications. With a wide range of DC power input support, PPC-3060S will work stably between 12-24VDC and has been FCC class B certified whilst also being compliant with the EMC immunity, emission standards - EN55011, 61000-6-2, 61000-6-4 - for industrial environments. With cost saving Android OS support, low power performance CPU, Advantech’s WISE-PaaS/RMMsoftware for centralized remote management, elegant TrueFlat screen and alloy enclosures. To find out more about how PPC-3060S can help machine builders and industrial equipment manufacturers, contact your local sales representative or go to www.advantech.com. Engineers, OEMs, and integrators have struggled for years to balance the cost of PLCs with their I/O needs, and Turck's new ARGEE technology solves this challenge. ARGEE empowers manufacturers to add logic to compatible I/O devices without a PLC, driving down the cost per I/O point and increasing flexibility in control. The ARGEE environment is accessible via an HTML5-compatible web browser, which eliminates the need for complex third-party software or licensing that is common with PLCs. Inside the ARGEE environment, users can set condition and action statements to be carried out by the I/O device. The application's intuitive design includes a flow chart - similar to ladder logic - which allows for easy programing by users of all experience levels. By taking advantage of ARGEE on Turck's multiprotocol Ethernet I/O devices, manufacturers are able to realize a better control solution - field logic controllers. The FLC backs up the PLC: If the FLC loses communication with the PLC, the FLC can take over and either shut down or maintain the process. The FLC and the PLC work together: The FLC can monitor an application and send defined variables and updates back to the PLC. "With FLC powered by ARGEE, engineers can add control capabilities and I/O points to applications without having to invest in or upgrade a PLC," said Randy Durick, vice president of fieldbus technology at Turck. "Because the I/O devices carry advanced ingress ratings, logic can move outside the panel and onto machines for local control and real-time performance monitoring." ARGEE technology is standard in all Turck multiprotocol Ethernet I/O devices. 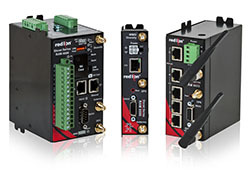 These devices can be used on any PROFINET®, Modbus TCP™, or EtherNet/IP™platform, and include the TBEN-L/TBEN-S on-machine block I/O, BL compact on-machine flexible block I/O, and FEN20 in-cabinet block I/O. Turck introduces the TBEN-L Ethernet spanner, which provides customers with a robust protocol converter, a much needed solution for applications dealing with multiple protocols on the same network. The TBEN-L Ethernet spanner capitalizes on Turck’s multiprotocol technology and serves as an easy way to link multiple Ethernet networks together - even networks that speak different protocols - and its master to master data exchange allows PLCs to exchange data easily. By utilizing Turck’s multiprotocol Ethernet technology and the embedded Ethernet switch, the device can allow isolated networks to pass data between them (up to 256 bytes), even if the networks are on different Ethernet subnets or using different protocols such as Modbus TCP, PROFINET or EtherNet/IP. Additionally, by utilizing the isolated Ethernet network, the TBEN Ethernet spanner offers the ability to setup a NAT (Network Address Translation) router for up to 5 IP addresses. The devices also include an embedded webserver for a streamlined setup and configuration process. The TBEN-L spanner offers 16 digital inputs that are available to both networks and allows data transfer speeds of up to 100 megabits per second. Additionally, the spanner comes in a glass-fiber reinforced housing with fully potted electronics and offers a IP65, IP67, or IP69K rated housing. New 240W CP10 models with output voltages of 36V (CP10.361) and 48V (CP10.481) available. With the DIN rail power supply CP10.241 (24V / 10A) PULS introduced a record breaker in 2015: width 39mm, weight 600g, efficiency 95.2% and a typical service life of 120,000 hours. From now on further 240W models of the CP10 series are available with output voltages of 36V (CP10.361) and 48V (CP10.481). In these models the efficiency has been increased even more: 95.4% at CP10.361 and 95.5% at CP10.481. This means less stress on the electronic components and a higher energy efficiency. The CP-series is part of the PULS DIMENSION product family. In addition to the high efficiency values, the power supplies are characterised by an advanced inrush current limitation, active PFC and a wide temperature range of -25°C to +60°C (without derating) or +70°C (with derating). Numerous approvals (IECEx, ATEX, Class I Div2, UL) allow the use in various applications and international markets. In addition, the CP-series includes power reserves of 20%: 288W of power is constantly available up to a temperature of +45°C. For the reliable triggering of fuses, the CP10 can briefly supply three times the specified output current. The CP10 is equipped with differentiating features, such as a DC OK relay contact for monitoring the output voltage. Additionally, there are also product models for special applications, which require an extended DC input range, spring-clamp terminals or conformal coating (on request). Minneapolis, MN—March 15, 2016—Banner Engineering introduces its next-generation touch buttons for its industry-recognized K30, K50 and K70 multicolor indicators and pick-to-light sensors. Employing smart electric field sensing, the next-generation touch buttons provide superior immunity to false triggering caused by the buildup of detergents, oils and other foreign materials, as well as exposure to direct water spray. The K70 is a brand new addition to Banner’s multicolor and pick-to-light sensor family. Featuring a 70 mm touch dome with a 30 mm base, the K70 touch is optimal for larger industrial applications in addition to jobs that require more visibility. The K70 is available in nine color options and one-, two- and three-color models for flexible performance. The next-generation K30 and K50 offer flexible communication and simplified setup of a single device or multi-point applications. The K50 is available in one-, two- and three-color models, while the K30 is available in one- and two-color models. New FDA models are also available, which are constructed from FDA-grade material and fully encapsulated for use in food and beverage applications. In addition to exceptional immunity, next-generation K30, K50 and K70 indicators are ergonomically designed to eliminate hand, wrist and arm stresses associated with repeated switch operation, requiring no physical force to operate. The indicators can also be easily actuated with bare hands or in gloves. The next-generation touch buttons offer momentary or latching versions. Momentary configurations remain activated as long as touch is present, while latching models start up inactive and toggle between activated and not activated on successive touches. All models feature rugged, fully encapsulated IP67/IP69K construction for optimal performance in high-pressure wash-down environments. You will now be able to register automatically multiple eWON on your account thanks to the Global Registration Key. After simply storing it on a SD card, you can then plug it in your eWON which never was linked to a Talk2M account before. The eWON will automatically process the files. The only thing left to do is to accept the device within your account. An additional easy as a child toy way to register your eWON is born. Visualize all your eWON's on a map: a great feature to manage your EWONs at glance. Easy connection, easy location modification, reset, etc. You can now choose between the classic view list of all your eWON's or the map view! Type a particular reference you are looking at and eCatcher is going to sort out for you among your eWON's. Easy! You are now easily able to design a customized M2Web Portal and integrate it into your own website. Your customers will never get lost and your brand is more strongly represented! Turck is expanding its portfolio of capacitive sensors, now offering 18 mm and 30 mm capacitive barrel sensors with teachable capabilities. The new offering comes in two variants – teach by wire or teach by button. The teach by button variant can be taught by a single press of a button, saving valuable installation and configuration time. Both present and absent media can be taught for a higher sensitivity teach. The variant without a push button can be taught either by a teach adapter or teach by wire (pin 5), which allows for a tamper-resistant installation. Each variant is available in either PNP or NPN. The 18 mm housed version offers a 5 mm sensing range when flush mounted and a 7.5 mm range when not flush mounted. The 30 mm housed version offers a 10 mm sensing range when flush mounted, with a sensing range of 15 mm when not flush mounted. The expanded offering can be switched between NC and NO, and provides optical programming feedback through LEDs. CHARLOTTESVILLE, Va. — Jan. 13, 2016 — Temperature, shock and vibration. These are just a few of the challenges that can create issues for railway control systems on a daily basis. To help ensure these critical systems maintain reliable operation, GE (NYSE: GE) has launched its new RXi-XR Industrial PC (IPC). This latest offering from GE’s Automation & Controls solutions provides transportation systems such as inner-city, monorail and regional trains with a rugged, versatile computer capable of functioning in the demanding and harsh environments typically associated with these applications. The new RXi-XR IPC provides a combination of rugged construction, high performance and modularity to deliver the computing capabilities required in demanding rail environments. It’s featured fanless, solid-state design and industrial-strength components enable GE’s RXi-XR IPC to meet EN50155 standards for electromagnetic, temperature, shock and vibration compatibility in railway applications. The IPC’s design also meets the IP67 rating for dust and moisture protection, ensuring that the unit is dust tight and can withstand up to 1 meter of liquid immersion. The RXi-XR IPC’s patented heat dissipation technology enables the unit to boast an operational temperature range of -40 C to 70 C, enabling the computer to perform in extreme temperature conditions. In the RXi-XR IPC, both the CPU and memory are soldered to the board, improving reliability and resistance to shock and vibration. In addition, the IPC’s COM Express-based modular architecture simplifies the upgrade process, extending the unit’s useful life and helping to future-proof the system. Compact MI2 connectors also contribute to the ruggedness of the IPC by helping to prevent couplers from loosening — even under extreme vibration conditions. GE’s RXi-XR IPC features either an Intel Core i7 processor at 1.7 gigahertz (GHz) or an Intel Celeron processor (at 1.4 GHz) and runs the Windows 7 operating system. It has a maximum memory of 4 gigabytes (GB) and a storage capacity of 128 GB (in the form of a solid-state drive). York, Pa. – February 9, 2016 – Red Lion Controls, the global experts in communication, monitoring and control for industrial automation and networking, today announced the availability of its new rugged E3 I/O™ module platform, a set of 17 high-density I/O modules with hardened metal enclosures and powerful communication options. This versatile platform marks Red Lion’s first rugged I/O modules configurable using Crimson® 3.0 software. Designed to withstand the critical demands of localized and distributed I/O applications, Red Lion’s Crimson-enabled E3 I/O modules feature robust networking capabilities with redundant Ethernet ports and built-in serial communication. With one RS-485 terminal block and dual Ethernet ports that include user-selectable Ethernet modes for ring, pass through and two network, the easy-to-deploy E3 I/O modules can eliminate the need for additional switching devices. In addition, these modules offer up to 34 mixed I/O points including input/output, analog/discrete and temperature I/O for complex industrial applications. Available in DIN-rail and panel-mount form factors, Red Lion’s E3 I/O modules feature rugged metal enclosures to support wide environmental tolerances and enable seamless integration into any industrial environment. Wide -40° to 75°C operating temperature, high shock and vibration ratings coupled with industry certifications that include UL Class I, Division 2 listing, ATEX* and IECEx* approvals make each E3 I/O module safe for use with industrial control equipment in hazardous locations around the world. Developed for industries including oil and gas, water, utilities, marine, transportation and mining, the E3 I/O module platform is ideal for critical-uptime applications where customers need to expand I/O for devices such as Human Machine Interfaces (HMIs) or standalone deployments. Minneapolis, MN—January 19, 2016—Banner Engineering introduces its new M18-4 self-contained photoelectric sensors. Featuring robust IP69K-rated 316 stainless steel housing, the heavy-duty 18 mm metal barrel sensor is ideal for harsh industrial environments where abrasive chemicals and ingress fluid are present. Built with Advanced ASIC (Application Specific Integrated Circuit) technology, the dc-operated M18-4 sensors are also resistant to fluorescent light and offer a high level of crosstalk avoidance. Featuring a powerful and bright visible red emitter beam, the M18-4 allows for easy alignment and set-up. For added ease of use, the M18-4 sensor also offers a highly visible output, and dual-function power and stability indicators. The indicators are comprised of one green and two yellow LED lights. Solid green indicates power is applied and the sensor is ready, while green flashing specifies a marginal sensing signal. The two bright yellow LEDs, visible from both sides of the sensor, indicate the output is conducting. To accommodate diverse applications, the M18-4 is available in opposed, polarized and non-polarized retroreflective, diffuse and fixed-field sensing modes. For increased flexibility, diffuse models offer a robust 250 degree sensitivity potentiometer. A wide operating temperature range of -40 to +70 degrees Celsius ensures optimal performance for diverse applications. 2016-01-18. Cables in support arm systems need to be able to be installed quickly and easily for retrofitting or servicing. This requires easy accessibility without having to dismantle already installed support arm systems. Rittal offers an ingenious solution to cut assembly outlay with the open support ­sections of its CP 60/120/180 support arm­ system. Herborn, 18 January 2016 – Today, support arm systems for machine operation don’t just need to offer a smart design and high load-bearing capacity but also straightforward cable management. Cables need to be accessible quickly and easily in the event of damage or for retrofitting. The open support sections of the Rittal CP 60/120/180 support arm system meet these requirements with ease. Clip-on and flexible plastic covers also enable easy access to the cables in the support arm section when the support arm is mounted. Cables can be easily laid or replaced by simply removing the covers. The section diameters of the support arms also offer room for pre-assembled cables with connectors (e.g. DVI). To also stabilise open support sections with a long jib to prevent them from twisting, clamping elements can be installed in the open area of the support sections. This achieves loads comparable to those for closed support sections. The clip-on plastic cover conceals the clamping elements. This simple and effective option provides additional stability and safety. The CP support arm system can be configured for the three load levels of 60, 120 and 180 kg (based on a jib length of one metre). It has a standardised design, with its modular system offering the perfect solution for every requirement and delivering considerable time savings for assembly/adjustment. Advantech’s new 12” TPC-1282T touch-panel computer is the first of its type to feature with the new Intel 5th Generation Core i3 Processor; the much heralded iDoor Technology and CODESYS support. The TPC-1282T is the first in the TPC range to use Intel’s 5th Generation Core i3 processor, which provides an additional 15% increase in speed compared the 4th generation processors and faster also refreshes graphic images 30% faster. All of these benefits are achieved whilst maintaining low power consumption and enhanced reliability. Advantech’s new iDoor technology is a new modular way of adding versatile functionality to give system integrators the flexibility to choose the functions that they need without purchasing devices that have excess costs and functions that they’ll never use. With Isolated DI/O ports, Power over Ethernet, Profibus and CANOpen modules iDoor Technology gives a cost efficient solution to increasing the functionality of the TPC-1282T. Having partnered with the world’s leading SoftLogic software developer, the TPC-1282T is one of the first touch panel computers to have CODESYS embedded on it. On their website CODESYS is described as “… a software platform especially designed to fulfill the many different requirements of modern industrial automation projects. The IEC 61131-3 programming tool CODESYS Development System is the heart of CODESYS. It offers integrated, user-friendly solutions to supportthe user in developing his task.” By collaborating with CODESYS Advantech has begun building the software platform directly into their hardware. In the past system developers had to write different pieces of code for each of the separate devices, with CODESYS there is only need to write one piece of code for all machines and distribute it over Ethernet. This greatly speeds up development time and integration with third party devices. Advantech’s TPC range is renowned for its multitude of I/O ports and expandability and the TPC-1282T is no exception since it has: two USB 3.0 ports for high speed devices; a PCI slot for adding functions; the iDoor Technology slot uses a mini PCIe connector and if not being used for iDoor modules it can be used for adding additional cards such as Wi-Fi, 3G and GPS. As well as the Intel Core i3 2.1 GHz processor, the TPC-1282T also includes 4GBDDR3L SDRAM and can be used with a variety of Microsoft Windows operating systems, Linux and Advantech software applications such as WebAccess, Panel Express and SUSIAccess. So it can be kept clean, the front panel is IP65 certified front panel to allow it to be washed with water. Minneapolis, MN—December 8, 2015—Banner Engineering introduces its DF-G3 discrete long-range fiber amplifier with dual digital displays for use with plastic and glass fiber optic assemblies. Featuring increased sensing power, the DF-G3 can sense more than 3 meters (10 ft.) with opposed mode fibers or more than 1 meter (3 ft.) with diffuse mode fibers. The extra power provides increased detection reliability for dark targets at long range and enhanced detection sensitivity when using specialty fiber assemblies for large area and small part detection applications. The DF-G3 is available with a single discrete output or two dual discrete outputs. The dual discrete outputs can be independently taught to trigger at different intensity values, which is ideal for correct part-in-place or error-proofing, bottle down, and edge guiding applications. Users can also setup the sensor remotely via a multi-function input wire which can be configured to control the LED, gate the amplifier’s output, remote teach the amplifier, or setup a robust cross-talk avoidance ring with up to seven amplifiers to solve dense sensing point applications. The DF-G3 offers a simple interface to ensure easy setup and programming via displays and switches. The easy-to-read dual digital displays show both signal level and threshold simultaneously. Featuring energy-efficient light resistance, the DF-G3 provides stable detection in industrial lighting environments. The sensor’s level action fiber clamp ensures stable, reliable and trouble-free fiber clamping. Minneapolis, MN—November 24, 2015—Banner Engineering introduces a new Frequency Modulated Continuous Wave (FMCW) radar sensor for reliable detection of moving or stationary objects. Featuring a very narrow 11 by 13 degree beam pattern, the R-GAGE™ Q240 sensor is ideal for monitoring a specific area without detecting adjacent objects. With two independent adjustable sensing zones, the sensor provides far and near proximity warning signs with the capability to detect objects over 40 meters away. The R-GAGE Q240 provides easy setup and configuration of range, sensitivity and output with simple DIP switches, avoiding the training and complicated PC interface required for many other products. The sensor also features rugged IP67 housing to withstand harsh environments and ensure reliable performance in temperatures ranging from -40 to 149 degrees Fahrenheit. The sensor has no moving parts and a rugged design that resists high-shock and vibration conditions. Combined with its robust outdoor performance, the R-GAGE Q240 is a more reliable solution with lower costs for purchase and maintenance than traditional laser scanner solutions. For optimal outdoor performance, the optional snap-on all-weather shield protects against extreme weather conditions and helps shed liquid off the face of the sensor. PLYMOUTH, Minn. (August 25, 2015) –TURCK announces an expansion to the YB2 line of compact disconnect splitters with LEDs. The new addition to the YB2 line features a translucent black overmolded design. This encapsulates the LEDs and protects them from physical damage while also complementing visibility. The LEDs are visible from both sides of the splitter, which allows for more flexible mounting options. The YB2 is available with an M12 (eurofast®) trunk connector and either M12 (eurofast) or M8 (picofast®) branch connectors. This YB2 splitter is used to consolidate two separate discrete PNP device signals into a single cable or into a multi-port junction box. It is an ideal solution for applications in the material handling, food and beverage, and automotive industries. Additionally, The YB2 is the recommended consolidation splitter for customers using TURCK’s Z-style junction boxes. Minneapolis, MN—August 4, 2015—Banner Engineering introduces new heavy-duty Vantage Line fiber optics to complement its industry-recognized fiber amplifier product family. Featuring a flexible 304 stainless steel tube, the polyethylene jacketed plastic fiber is protected from crushing or abrasion in harsh industrial environments. To accommodate diverse applications, the heavy-duty Vantage Line plastic fibers are available in eight different models, four with opposed sensing mode and four with diffuse sensing mode, in one- and two-meter options. All heavy-duty fibers are compatible with Banner’s existing plastic fiber amplifiers, including the DF-G family. Banner’s DF-G fiber amplifiers deliver stable sensing performance with fast response rates. With a thermally stable and high performance electronic design, DF-G fiber amplifiers feature dual display, digital readouts and an improved fiber clamp. DF-G fiber amplifiers also offer complete user control, providing manipulation of all operating parameters, including switch point threshold, light operate or dark operate, various output timing functions, electronic gain level and sensor response speed. York, Pa. – July 21, 2015 – Red Lion Controls, the global experts in communication, monitoring and control for industrial automation and networking, today announced that 4G LTE multi-carrier cellular support for major North American carriers is now built into its rugged Sixnet® series RAM® and IndustrialPro® cellular automation products. New multi-carrier capabilities enable customers to simplify deployment and reduce inventory requirements by selecting from a list of preconfigured wireless carriers that include AT&T, BELL Mobility, Rogers, TELUS and Verizon Wireless. With 4G LTE support for multiple North American carriers in each unit, customers using Red Lion’s RAM cellular RTUs and IndustrialPro routers can easily select and switch between wireless carriers to alleviate varying cellular coverage or bandwidth issues without having to replace equipment. In addition, a powerful built-in event engine can trigger I/O or send SMS text messages based on real-time data to provide automation engineers, technicians, production managers and network operators local control and real-time remote monitoring of field-deployed assets. Red Lion’s cellular automation devices combine optional I/O and Wi-Fi with active GPS and multiple serial and Ethernet ports to securely monitor remote devices over a 4G LTE cellular network with fallback to 3G. Ideal for deployment in industrial M2M networks such as oil and gas, water/wastewater, utility, transportation and mining applications, RAM and IndustrialPro cellular RTUs and routers provide a seamless network extension to remote locations. PLYMOUTH, Minn. (July 21, 2015) –TURCK is pleased to announce their new family of teachable ultrasonic sensors. The new ultrasonic sensor series from TURCK enables the user to cover large sensing ranges with fewer sensor variants and short blind zones. The sensors are available in 18mm and 30mm barrel housings with sensing ranges from 40cm to 300cm. Designed for rugged industrial applications, these sensors are IP67 rated and an ideal solution for object detection and liquid level applications. In order to offer the right sensor for every application, TURCK has increased the versatility of the individual models. The simple compact version of the RU40 and RU100 modules enables the user to set the sensing range as well as NC and NO switching outputs with a teach adapter. The standard sensor versions also enable the setting of switch windows and two separate switching points, either by a teach adapter or via a teach button directly on the sensor. The high-end versions can be operated as a switch or as an analog sensor. Different operating modes, temperature compensation or the output function can also be set via IO-Link. If several sensors are installed next to each other, the customer can set the sensor parameters in synchronization or multiplex mode, in order to prevent mutual interference of the sensors. An optional USB master is also available which enables interface and parameterization of high-end sensors via IO-Link. TURCK has developed a series of training videos to detail the features and benefits of each variant, and how to program the different output types. The videos can be found on TURCK’s YouTube Channel, TurckTV, or by clicking on one of these links: http://youtu.be/0p-zKBsxFMo, http://youtu.be/Ya0KhseSyMg, and http://youtu.be/9xRHXp8uwbw. There is also a brochure on TURCK’s ultrasonic offering that can be downloaded here: http://old.turck.us/assets/B1104_Ultrasonic_Sensors.zip. Minneapolis, MN—July 7, 2015—Banner Engineering has improved its industry-recognized Q4X laser distance sensorwith a new dual teach mode. Featuring new firmware, the Q4X dual teach mode sensor combines window thresholds on both target distance and target reflected intensity, allowing the Q4X to reliably solve difficult applications with ease. The Q4X can now detect clear objects without requiring a retro-reflector. Dual mode can be used to error-proof applications by ensuring the correct color part is located at the correct position. Banner’s Q4X reliably detects distance changes as small as 1 mm and covers a 25 to 300 mm range. The sensor was already ideal for difficult distance-based sensing applications as it easily detects objects regardless of target surface reflectivity, including black foam on black plastic, black rubber in front of metal, multicolor packaging and targets of all colors. Now with the dual teach mode, the sensor can detect small changes in reflected intensity for targets inside the distance threshold. This powerful combination allows the Q4X to solve many new applications. Minneapolis, MN—June 23, 2015—Banner Engineering introduces the WLS28-2MQ motion detector switch for automated lighting. Banner’s motion detector switches provide an efficient solution to automatically turn on or off the light in applications where a physical switch cannot be used or the placement of the switch is not useful. Banner’s motion detector switches are available in two options, an in-line module or built-in motion detector for the company’s industry-recognized WLS28-2 LED Strip Light. The in-line module allows operators to place the motion detection switch away from the light, and can be used with any Banner dc voltage lights. The WLS28-2 with built-in motion detector models provide easy and fast installation in one place. Banner’s WLS28-2 LED Strip Light delivers a versatile lighting solution, featuring a space-saving, low-profile design and various lengths from 145 mm to 1130 mm. For increased flexibility, the WLS28-2 Dual Color is available in cascadable models for connecting multiple lights end-to-end. All models offer enhanced light quality with bright, densely spaced LEDs to ensure even, bright and highly efficient illumination. 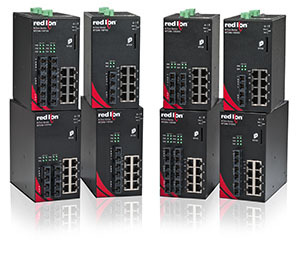 York, Pa. – June 9, 2015 – Red Lion Controls, the global experts in communication, monitoring and control for industrial automation and networking, today announced the addition of 18 new compact models to its N-Tron® series NT24k™ managed Gigabit Ethernet industrial switch platform. The new NT24k 10-to-14 port DIN-rail mountable switches feature Fast Ethernet, Gigabit or dual-mode fiber ports alongside eight Gigabit copper ports with optional IEEE 802.3af/at Power over Ethernet Plus (PoE+) support. Available with optional PoE+ support, each switch accepts redundant 22-49 VDC power input and offers a step-up power boost circuit to eliminate the need for a standalone 48 VDC power supply. In addition, Red Lion’s new PoE+ switches provide up to 240 Watts PoE output power (30 Watts per Gigabit copper port) to reliably support applications such as security cameras, panel displays and wireless access points. Red Lion’s rugged NT24k platform offers a full set of management features and advanced security to ease network deployment with key functionality that includes Jumbo Frame support, SD card and XML configuration backup and restore, auto-IGMP configuration, Ethernet/IP™ with CIP™ messaging, N-Ring™ and N-Link™ ring technology with ultra-fast (30 ms) recovery, N-View™ monitoring technology, event logging, SNTP and IEEE 802.1x with RADIUS remote server authentication. NT24k switches are UL Class 1, Division 2 Listed for use in hazardous and ordinary locations and are ABS type certified for shipboard applications. These approvals help ensure reliable operation across alternative energy, oil and gas, water/wastewater, maritime, transportation, intelligent traffic applications and factory automation applications. PLYMOUTH, Minn. (June 5, 2015) –TURCK has added the Q4.7 series of rectangular inductive sensors to its range of miniature sensors. The miniature sensors in the new design (16 x 8 x 4.7 millimeters) have been specially developed for applications in which they have to be fully embedded in metal, such as in the stamping and metal forming industry. These kinds of applications not only require robust sensors with large switching distances, but also very small housing to reduce the amount of surrounding metal to be removed for the recesses. The Q4.7 meets all the requirements mentioned with a two millimeter sensing range, a robust metal housing, a highly flexible twometer connection cable with an oil-resistant sheath and the capability of being fully flush mounted. TURCK has managed to house the status LED in the active face so that this, in contrast to side mounted LED sensors, stays visible even when fully flush mounted. In order to meet a wide variety of application conditions, the Q4.7 has a temperature range from 0 to 85° Celsius and is IP67 rated. Minneapolis, MN—June 9, 2015—Banner Engineering introduces itswireless vibration and temperature sensor, Designed to effectively monitor machines for increases in vibration and temperature, the sensor measures RMS velocity in inches per second or millimeters per second, and temperature. This enables the sensor to identify machine problems before they become too severe and cause additional damage or result in unplanned down time. The sensor is optimized to work with 1-wire serial radio devices, such as Banner’s wireless Q45VT Node, the P6 Performance Node and the MultiHop M-H6 radio. Operators can easily set vibration thresholds based on the ISO 10816 standard. When a threshold has been exceeded, the wireless node can provide local indication, send the signal to a central location, and send the vibration and temperature data to the gateway for collection and trending. “Banner’s wireless sensor provides continuous vibration and temperature measurements to quickly detect any machine failure or potential problems,” said Scott Pritchard, Director of Wireless Global Sales, Banner Engineering. “This allows facility managers to reduce labor costs by eliminating manual checks and the risk of human error. The wireless vibration and temperature sensor is ideal for a variety of machine monitoring applications, including motors, pumps, blowers and many other types of machines throughout a facility. Manufactured with a robust zinc alloy housing, Banner’s wireless vibration and temperature sensor provides reliable performance in harsh environmental conditions. The sensor also offers multiples mounting options, including hex screw, epoxy, thermal transfer tape or magnetic bracket mount, to accommodate diverse applications. Minneapolis, MN—May 26, 2015—Banner Engineering introduces its SI Series Safety Limit Switches, designed to effectively monitor the position of a wide variety of guards, gates, covers and other moveable machine fixtures and tooling. The SI Series is available in three models—SI-LM40, SI-LS31 and SI-LS83—offering various actuating systems, contact arrangements, housing and mounting configurations to satisfy diverse industrial applications. Banner’s SI Series feature a limit-switch style, complying with Type 1 per ISO 14119 standards, with actuating elements integrated with the enclosure. Configured with a positive-opening design of the normally closed contacts, per IEC 60947-5-1 standards, these switches provide reliable monitoring regardless of environmental conditions and withstand any attempt to override the switch and defeat the system. York, Pa. – May 26, 2015 – Red Lion Controls, the global experts in communication, monitoring and control forindustrial automation and networking, today announced that its rugged Graphite® Human Machine Interface (HMI) operator panels have been certified to operate in global ATEX zone 2/22 and IECEx zone 2 environments. Following Underwriters Laboratories (UL) Class I, Division 2 Listed status received last year, these approvals certify that Graphite HMIs are safe for use with industrial control equipment in potentially explosive, hazardous locations around the world. Red Lion’s touchscreen Graphite HMIs are now able to provide organizations with powerful monitoring and control capabilities regardless of operating environment, even locations subject to potentially explosive atmospheres that may result from gas, vapor, mist and/or dust. This enables industrial customers in markets such as oil and gas, flour and grain, mining, chemical, painting and metal processing to benefit from rugged aluminum construction, wider operating temperatures and high shock/vibration tolerances. From factories to extreme locations, Graphite HMIs enable customers to connect, monitor and control processes across a broad range of industries to meet varying industrial automation requirements. Since its launch in July of 2013, Red Lion’s Graphite platform has received numerous global accolades, including Automation World’s “First Team Supplier, HMI Hardware” award, the “Industrial Control Award” from Plant Engineering China and “Best Product of the Year” from Control Engineering China. Waukegan, IL. Yaskawa is pleased to introduce its greenest drive ever, the all new U1000 Industrial Matrix Drive, the product that enhances performance beyond that of a conventional AC drive. Enjoy extremely low harmonic distortion and regeneration in a space-saving design, completely without the need for additional components. Unlike conventional drives, Yaskawa’s Matrix technology employs a system of 9 bi-directional switches that are arranged in a matrix to convert a three-phase AC input voltage directly into a three phase AC output voltage. This eliminates the need for a rectifying circuit and DC smoothing circuit that are used in traditional AC drive “inverters”. The result is a compact drive with full regenerative capability and reduced harmonic distortion. Full Power Regeneration: Traditional drives utilize regenerative braking resistors to dissipate energy as heat, reducing energy efficiency. The U1000 Industrial Matrix drive allows you to return regenerative energy directly back to the power supply, increasing energy efficiency and saving money. Power Quality Improvement: When a conventional AC drive converts power, the input current becomes distorted, resulting in reduced power quality. Matrix technology reduces total harmonic distortion levels to 5%, without the need for reactors and filters. The result is a smoother current waveform that reduces stress on the system power supply and infrastructure. Additionally, reduced distortion improves power factor and thus, reduces energy costs. Additionally, the Matrix drive is a member of the Yaskawa industrial drive family, and provides the same user experience as Yaskawa’s popular 1000 series drives. Minneapolis, MN—May 12—Banner Engineering announces its industry-recognized Q3X laser contrast sensor is now available with fixed background suppression. Featuring contrast detection, plus fixed background suppression, the Q3X LD50 reliably detects targets within the desired sensing range while ignoring objects in the background. Out of the box, the Q3X LD50 operates like a fixed-field laser sensor and detects targets within its 50 mm sensing range. However, the sensor can be programmed for low-contrast sensing within this range, while ignoring objects at least 60 mm away. This allows the sensor to accurately detect its target without background objects affecting its performance. Featuring high-speed part detection as fast as 250 μs, Banner’s Q3X laser contrast sensor can capture up to 2,000 events per second. This, along with background suppression, makes the Q3X ideal for solving applications with small contrast changes where a background needs to be ignored. A typical application is label detection on a bottle where contrast differences between the label and bottle provide reliable detection but the sensor must ignore the shiny metal rail in the background. The shiny metal background could cause a false trigger for standard diffuse-mode sensors. The Q3X’s robust nickel-plated zinc die cast housing ensures reliable performance even in environments with exposure to cutting fluids and oils. Sensors are also rated to IP67, IP68 and IP69K for enhanced protection to water submergence and high-pressure washdown. For more information on the Q3X laser contrast sensor with fixed background suppression, watch the video: https://www.youtube.com/watch?v=TrEQLLYuicY or visit www.bannerengineering.com. About Banner. Banner Engineering is a world leading manufacturer of photoelectric and ultrasonic sensors, indicator lights, vision sensors and vision lighting, electronic machine guarding systems, wireless networks, fiber optic assemblies and precision measurement systems. Banner has released the second generation WLS28-2 work light strip. This product is a drop-in replacement for existing WLS28 installations. All models include intensity level settings of 100% and 50% through wiring or optional High/Low/Off switch. High power solid state LED array emits a more uniform light pattern due to 3X increase in LED density. The WLS28-2 work light strip is beneficial to panel builders and original equipment manufacturer (OEM’s). With offices throughout North Carolina, we are the leading, full-service Industrial Controls Distributor in the region. We provide total solution capability – from parts and installation to on-site training and fully engineered systems. Clients include many Fortune 500 companies as well as many local and regional manufacturers. For more information or to place an order, call (855) 516-9260 to talk with one of Triad Automation’s factory automation experts. Company Info: Banner Engineering designs, manufactures and distributes photo eyes, sensors and associated products for industrial and process automation — worldwide. Banner is expanding the SureCross Wireless Q45 product family with the addition of an environmental measurement solution. The SureCross Temperature and Humidity Sensor Solution provides reliable wireless measurements without the need for costly wiring runs to the monitoring point(s). 1. Reliable wireless environmental measurements without the need for costly wiring runs to the monitoring points. 2. The battery powered wireless Q45 Sensor node pairs with the B2T Gateway module that automatically maps the temperature and humidity measurement from the Wireless Q45 Sensor Node to the two 4-20 mA analog current outputs. 3. With no need for setup software and providing a battery life of up to 2 years, this is a true Simple Wire Replacement Solution. About Triad Automation: With offices throughout North Carolina, we are the leading, full-service Industrial Controls Distributor in the region. We provide total solution capability – from parts and installation to on-site training and fully engineered systems. Clients include many Fortune 500 companies as well as many local and regional manufacturers. For more information or to place an order, call (855) 516-926 to talk with one of Triad Automation’s factory automation experts. Minneapolis, MN—September 3, 2013—Banner Engineering announces theSureCross® Wireless Q45 Push Buttonwith confirmation light, the latest addition to the company's industry-recognized line of wireless sensors. The Q45 push button model’s bidirectional communication permits operators to send a digital signal with the push of a button and receive confirmation the signal has been received. The self-contained wireless radio network can operate on a two-point, six-point or multi-point system; its noise immunity eliminates crosstalk, while network IDs allow multiple systems to co-exist. The device’s frequency hopping signal ensures secure data transfer. The Q45 push button has a line-of-site range of up to 3,000 feet— enough to easily cover even very large factories. The Q45 pushbutton can run for up to five years on two AA lithium batteries, or it can be powered by a local 10-30V power supply. The battery option is ideal for applications that require the push button to be mobile or far from a local power source. The push button model is part of Banner's innovative SureCross DX80 wireless family, which is the world's first completely wireless I/O system. With hundreds of I/O models, it is the most powerful and flexible system on the market. It is ideally suited for call for parts, call for service or remote monitoring and control. York, Pa. – July 16, 2013 – Red Lion Controls, the global experts in communication, monitoring and control for industrial automation and networking, today announced the release of its newest generation of Human Machine Interfaces (HMI) – the Graphite™ series of advanced operator interface panels. With all cast-aluminum construction, the Graphite series provides the industry’s first rugged HMI solution to combine a wide range of versatile plug-in modules with protocol conversion, data logging and web-based monitoring and control. Red Lion’s Graphite series allows customers to easily connect, monitor and control their process in industries that include manufacturing, oil and gas, and water/wastewater. The series’ range of plug-in modules enables customers to easily create a solution for today, with an option to expand to meet changing business requirements. Further, organizations will realize a reduction in development and commissioning times over traditional systems that use an HMI paired with separate I/O, PLCs and other controllers. Graphite HMIs are available in eight different models, in sizes ranging from 7” to 15”, with sleek bezels that provide a relatively large display given their overall dimension. Both the 7” and 10” HMIs are available as sunlight visible models. Combined with Graphite’s rugged packaging, these models are ideal for harsh outdoor environments. Offering a built-in web server, Graphite HMIs enable users to monitor and control their application via PCs, tablets or smartphones. SMS text-messaging and email alerts provide early warning of process issues, which helps to avoid costly downtime. In addition, its built-in protocol converter allows programmers to select 13 or more simultaneous protocols from a list of over 250 to seamlessly integrate disparate devices such as PLCs, drives, barcode readers and panel meters. The new HMIs are supported by Red Lion’s award-winning Crimson 3.0 software, which is included at no extra cost. Crimson 3.0 makes it fast and easy to configure protocols, define data tags, set up sophisticated applications and create an attractive user interface. Designed for ease of use, Crimson allows customers to cost-effectively standardize on one HMI for all of their machines, regardless of the PLC or drive manufacturer used.